You'll discover tucked-away gems like Lesotho Co-operative Handicrafts and Gates of Paradise Pass. 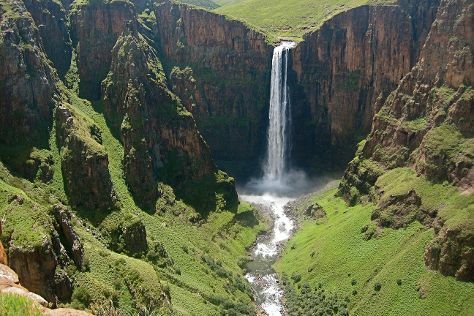 Take a break from the city and head to Maletsunyane Falls and Maluti Mountains. Venture out of the city with trips to Teyateyaneng (Ha Kome Cave Houses & Setsoto Design Gallery), Mafika Lisiu Pass (in Pitseng) and Morija Museum & Archives (in Morija). There's much more to do: steep yourself in history at Thaba-Bosiu National Monument, get engrossed in the history at National Museum, admire the engineering at Mohale Dam, and pause for some serene contemplation at Our Lady of Victory Cathedral. To see reviews, ratings, maps, and other tourist information, refer to the Maseru itinerary maker. London, UK to Maseru is an approximately 20.5-hour flight. The time zone difference when traveling from London to Maseru is 2 hours. Expect warmer temperatures when traveling from London in February; daily highs in Maseru reach 29°C and lows reach 19°C. You will leave for home on the 19th (Sun).